Aberdeen, Washington (CNN) -- The organic vegetables travel a short distance from the well-tended garden to the table where they are eaten. 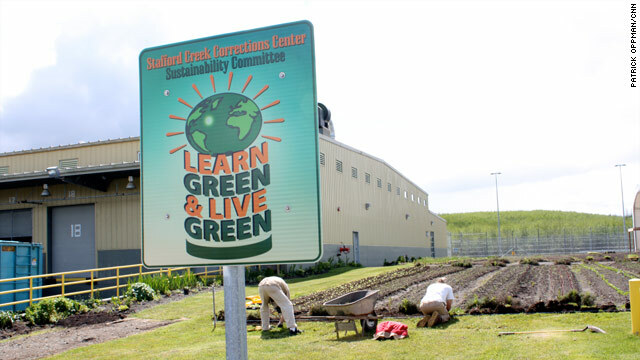 When ecologist and professor Nalini Nadkarni first pitched the idea of Washington prisons going green she didn't know how her proposed partners -- convicted criminals -- would respond. This has helped me get my head back on and stay out of trouble. Inmates at another state prison raise an endangered species of frog. The inmates work for less than a dollar an hour and as a result of their incarceration are able to take on time consuming and labor intensive projects. But the inmates are not just doing grunt work, Nadkarni said. Prater said he is hoping to pick up the skills that would allow him to work for the U.S. Forestry Service when he is released from prison in three years. How much do you know about organic food?